Montana, 2016 -- I fall gently onto the damp grass and open my eyes to the new world, I look up to see a roof of trees before me and I look sideways to my mama. She is a beautiful brown and white paint horse with a light brown mane and tail and one blue and brown eye. I am the same color! My mama nickers to me and I whinny back. She starts licking me, her warm tongue caressing my fur. "My little filly, you a must get up, for danger may hide in the woods," she says and gets up. She nudges me and I sit up, trying to stand up but my legs wobble underneath me. My mama encourages me again and again until I've stood up. I listen to my instincts and nurse, my mama nuzzles me after I'm done. I feel tired from everything after and I lay down in the thicket with my mama watching over me. When I wake up I look up to the sky and I see big puffs of dark, angry it seems circular shapes and sometimes ovals. I get up and my mama sees me looking. "Those are clouds but the ones you are seeing are thunder clouds, there is going to be rain," she explains and I look at her confused. "But mama, what's rain?" I ask. "You will see once it comes, now don't worry my filly, nurse," she says and I listen to her. After I finish nursing, little drops of water start falling from the sky and I try to chase them. One falls on my nose and I shiver because it's cold. "Come in the thicket!" My mama calls and I trot back. "That is rain," she says to me and I shiver. "It's cold mama." "Come close," she says and I press against her for warmth. After a while, the rain drops get bigger and thunder, as my mama calls it, starts booming. I squeeze my eyes shut and lay down, trying to get away from the frightening noises the thunder makes. My mama nuzzles me and lays beside me. After the thunder and rain stops, there is a beautiful blue sky and no clouds. The sun comes out and I see all the colours in a thick band in the sky. My mama calls it a rainbow. "My filly," she says to me one day while I am at her side, "I am going to give you your name and that is Rain," she says and smiles. "Thank you mother," I say and smile back. 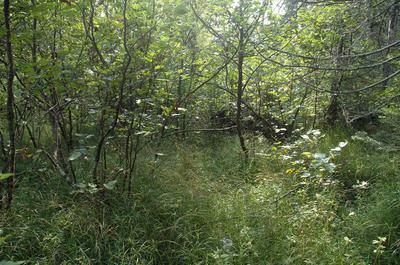 After a long time in the thicket and the field, my mother tells me it is time to go back to the herd. "When I knew you were about to be born I went away to have you to myself," she says to me. We begin the journey to the herd and we pass lakes and ponds, as my mama calls the pools of water. We also pass wheat fields, fields with golden crops in them that the humans grow. My mama bares her teeth a bit when she says humans and she tells me to not let one tame me ever. She looks into my eyes when she says that and I know I was born to be a mustang, not a tamed horse, for the humans. I nod my head. "Yes mama," I say and we continue cantering to the herd. Then suddenly, a vicious cat-like creature jumps out at me and my mama kicks it sending it flying. She runs over to it and it runs away. She trots back to me. "That was a cougar, it could've had you for dinner," she said and nuzzled me. "Always be cautious Rain," she says. Then we get to a hill and when I look over it I see hundreds of horses, maybe thousands!! My mama trots down the hill and I follow nervously. The herd looks up and whinnies to her, she whinnies back. Then a very big paint stallion neighs and canters over to us. She whinnies to him and they nuzzle. He comes over to me and my heart pounds. He sniffs me. "Hello Rain, I am your sire, West," he says in a deep voice. "Hi." I stumble over my words and he chuckles. Then he nuzzles mama one more time and says "strong foal, River," he canters back to the herd. PART TWO COMING! Tell me what you thought of my story so far in the comments! Thanks! I stare at her, wide-eyed and my eyes glisten with tears in them. "Really?! That's a miracle! I can't believe it! Thank you! Thank you for telling me that Lily! But where is she?" I exclaim and rear in joy. "Your mother has been captured by humans and so has the herd," she says and frowns a little. I rear again and nuzzle her. "Thank you so much Lily! We're going to get back the herd no matter what," I say and we all set off. After we've went a long way, Lily asks if we can stop to graze. We stop in a meadow and Wishful seems pretty protective of us, walking in front of us and grazing beside us. "Wish are you okay? You seem kind of protective over us," I say and he blushes. "Uhh, I'm okay. But you know we're all kind of a herd and a herd needs a stallion if it has mares, right?" He says and we neigh, "Yeah, I guess so," I say and Lily nickers, "Yep, we need a strong stallion to protect us," she says and we giggle. I blush and Lily grins at me in a foolish way and I blush even more. I avoid their faces by dipping my head to graze and I munch on the sweet grass. After a while, we hear a loud pounding and lift our heads, alert. Wish prances around us and neighs when three Cowboys on horses ride out of the bushes. We're taken by surprise and one by one, they throw ropes over our heads. Wish rears at them and nips one of the cowboy's back. He yells "Ouch! That's one protective stallion! He sure doesn't want us around his mares!" He says and another one admires me and touches me, I jump a little and back away, half rearing. "That's a very fine mare, he's got there, perfect conformation, we could use her for breeding." The others nod. "I agree, John," they say and start tugging us back to wherever they came from. We all fight the ropes but their harsh grips are too strong. They lead us over a hill and on the other side there's a human house, loads of horses, corrals and riding rings and a large barn with stalls and small-sized paddocks attached to the stalls. In front of the barn is a large brown sign that read in bold letters "Dakota Farms, breeding and riding centre". The Cowboys tug us along and we pass the large paddocks with herds in them, some of the horses whinnying to us and the stallions nudging or sniffing me and Lily as we trot briskly past. Some of the young foals make a shrill whinny at us and canter past their mothers to the fence, we whinny back. Then their mothers would herd them away from the fence. The Cowboys lead us into the stables and put Lily and Wishful beside me. The other horses whinny and one of the whinnies I recognize and call back to it. "Rain?! Rain is that you?!" The voice of a mare calls back and I whinny. "Yes! Mama, is that you?!" I neigh and she pokes her head out of her stall, her beautiful face tired and sad. But when she sees me her face lights up and she neighs to me. "Oh Rain! I missed you so much! Your father and two other mares named Janine and Mary are here! They're in their paddocks," she whinnies. "I missed you so much mama! I brought Lily and a stallion who rescued me named Wishful along!" I exclaim and she looks at Wish and Lily and nickers. "Oh, you've grown so much Rain!" I tell her the whole story and after I'm done I greet Father and the others with happiness. Then a cowboy leads me, Lily and Wishful and we rear at him and buck, causing him to let go of the rope and run away. We quickly kick at any horse's stalls that we can and run away with mother, Father, some other horses, and Mary and Janine. 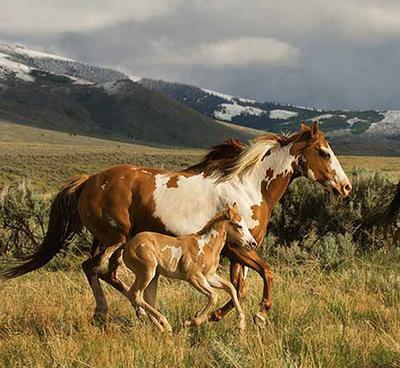 With that, we gallop freely once again to our beloved home, Montana, together, as who we are meant to be, Wild Horses. Well, that's the end of "The Story Of My Life!" It's pretty emotional but I hope you liked it! ❤️❤️❤️🐴🐴 Bye!! I wake up in the forest by where the herd is. Then I remember - the herd! I jump up from the ground and I neigh in pain when I stand. I fall to the ground and I hear a young male horse's voice. "Careful, you busted that leg pretty bad falling," the voice says and a charming pinto colt trots out of the bushes. He nickers. "My name's Wishful, what's yours?" He says and I say, bewildered, "Rain, how did I get here?" I ask and he responds, "well, I lost my mother too in that rush," and looks down sadly. "Oh, I-I'm sorry." He looks up. "It's okay, well anyways I saw you fall and I showed that wolf who's boss! Then I dragged you into the forest and tended to your leg." He explains and I get up. "Can you get me back to the herd?" I ask and he looks down again. "Uhh, well there might be a slight problem with that," he says and I raise my eyebrow at him. "Wishful, what happened?" "Well, you see after the herd ran away, the metal bird with wings drove the herd away all except for your father and a couple of mares. Then they decided it wasn't safe here and they're on this long journey to Dakota I hear." My eyes pop open and all these questions rush around my head. I gallop away, tears streaming down my face. I hear Wishful calling my name but I keep running. I stop and he catches up to me. "Rain! It's alright, we'll be okay." He says and nuzzles me. That surprises me and he blushes. "Where is my mother?" A sad, lost look appears in his eyes and I realize that she's not here anymore. A tear rolls down my cheek. "I'm so sorry Rain," he says and we mourn over our mothers. I can't believe my mother is gone and I remember the glisten in her eyes when she talked to me, the happiness in her voice when she laughed with me or talked to me. I'll always love her but I still hear my mother's voice in my head, telling me to keep going. "She's right!" I exclaim and Wishful gives me a strange look. "Who is right?" He asks, puzzled and I say "never mind. All I'm saying is that we need to keep going! We can reach our family no matter what," I announce and we set off on the long journey to Dakota, to my father, and to my family. We walk past forests and birds chirp, seeming to guide us, encouraging us on our journey. I lift my nose in the air and smell horse. "Wishful! I smell someone!" I say and a friendly looking mare and a foal come out of the woods. I approach her and she nickers to me. "Hello, I'm Rain and this is Wishful," I say gesturing to Wish and she smiles. "Hello, I'm Darcy and this is March," she says and nuzzles her filly. "We're looking for directions to Dakota," I say and she explains the directions to us and we say goodbye, leaving the friendly mare with her foal. "Well, that was helpful, nice folks," says Wish and I agree. We get pretty far when my throat gets dry and we stop at a pond. We graze and then set off again after drinking at the pond. Suddenly, Lily comes rushing out of the trees, her eyes rolling and I whinny to her "Lily! It's me Rain!" I neigh and she stops and turns to us. Then she sighs, "I'm glad it's just you. Rain! I can't believe you're here! Who's this?" She says walking over to us and gestures to Wishful. "That's Wishful." Part 4 coming soon!! Hope you like part 3! I'll get to part three, don't worry! You are so nice Claudia! Thank you so much! I really appreciate that you like my book! Thanks again! Part 3! Part 3! Part 3! Keep writing! Love it! One day, it will become a real book! I guarantee! Mama tells me to follow her closely and I wonder why but then again, there are hundreds of horses down there! She walks down the rocky hill and I stumble along. Once I almost slipped but I caught my balance at just the right time. "Careful Rain, dig your hooves in," she whinnies and I attempt to dig my hooves in but end up rolling down the grassy part of the hill. My mama whinnies to me, "are you okay Rain?!" She neighs. "Yup!" I'll tell you this, if horses could blush, I'd be as red as a tomato! Some mares chuckle at my foolishness and the foals giggle. I frown when my mama comes down beside me. "Everyone's laughing, Mama!" I say and she shakes her head and smiles in a motherly way. "Come follow me Rain," she says and leads me through the huge herd. Some horses nudge me or sniff me but I just keep trotting alongside my mama. When she gets to a circle of young foals, the age of me, she whinnies and the foals nicker. "Can my filly Rain play with you guys?" She asks sweetly and they bob their heads at that. I walk into the circle and mama leaves to talk to her mare friends. I whinny to her and she looks back for a second. "You"ll be okay Rain!" She calls and I nod. One of the foals, a palomino paint with a white circle over one of her eyes making it blue exclaims, "you can play tag with us!" I whinny back. "Okay!" And another foal, a blue roan colt yells, "you're it!" They all run away and I gallop after them. My specialty is being fast and I catch up to a red roan filly and nip her very gently to tag her. "You're it!" I yell and she grins. 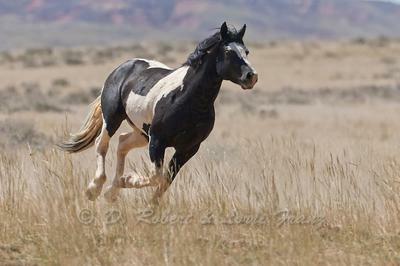 I run as fast as I can away from her and I see her tag a black pinto colt. He looks at me and gallops after me. "Oh no you don't!" I laugh and speed up, leaving him and the others in the dust. In the morning, the herd walks to the watering hole and I walk over to a shaded spot in the corner. I dip my head in the water and my father comes over. "Hello Rain," he nickers and I say, "hello, Father." I start to talk but he suddenly lifts his muzzle in the air and neighs. "Wolves! Wolves everybody!! RUN!" Then the peaceful waterhole becomes a madhouse as wolves run out of the trees. My father neighs to me, "Run Rain! Run as fast as you can!" My instincts take over me and I run for my life out of the watering hole. Then suddenly I remember, Mama! I stop and frantically search all around me but I can't find her. I run this way and that and then I realize I'm just wasting my time. I sprint after the herd but stumble on a rock and I land on the rocky ground. My leg aches but I get up. "Oh no," I moan as I look in front of me. The herd is so far away from me that from here, they're only dots. A wolf comes up behind me and I half limp-half run away from it. Then suddenly, so quickly that it just flashed before my eyes, someone saved me, a horse. Thoughts swirl around my head and my leg aches so much that I black out. The horse drags me into the woods saying, "you'll be okay, don't worry Rain," the last thought pops in my head. How does she know my name?! It's adorable! Keep writing! Love it! I love the way he wanted to chase the rain!